When our existing clients, creators of Bin 4 Burger Lounge, decided to make the move into the pasta scene ~ we teamed up again to create this exciting new brand. From logo and branding development, to business collateral, to designing the interior of this flagship location, the goal was to capture the welcoming comfort of a delicious bowl of pasta in a modern, dynamic room. Polished concrete floors, exposed over-height ceilings, natural wood wall cladding and caramel leather tones balance what could be a cold industrial space with warmth and texture. Large woven Moooi Emperor cage lights are suspended over modular bench seating in the center of the room creating a dramatic focal point. 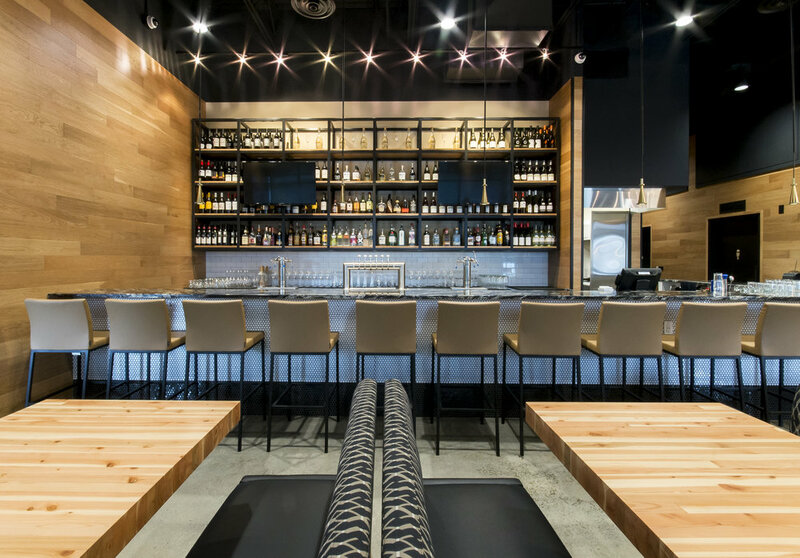 Accented with black and brushed brass metals, granite counters, geometric upholstery and custom made fir table tops, the space is bold and rich.